Even more sampans! A larger watercraft for hauling cargo out of Shanghai or other southeast Asian ports of call. 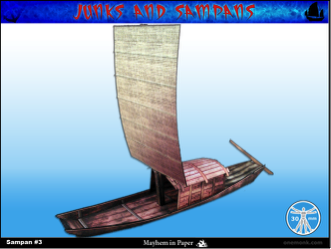 This Sampan paper model measures 8.75 inches in length x 1.75 inches wide. Two hull colors, two sail colors, two mast colors, two sail baten colors, three deckhouse colors, two deckhouse trim colors. Available as both single and multi-layered pdf. It is suitable for use with 28-30mm miniatures. It is intended to be printed on 80-110lb cardstock and is not suitable for playing with in the bathtub. 4/6/2013 Update - Optional raised deck sections and cabin variant added. This title was added to our catalog on October 13, 2012.